Saturday July 10th 1909 Will helped me do a big washing and wash a carpet I baked a cake before dinner. He went to town in afternoon I ironed and got things ready so I went down home and 5.12 Mary Briggs was there and we talked about going to Seattle we all went down to Otts for fireworks after supper. I came home at 9.50 Will met me at the crossing. Sunday July 11th 1909 I did up the morning work and wrote a letter to Lydia Mason and Lev Duncan before dinner. In the afternoon I wrote Lizzie Lindley and read some I took the letters down to Corolville as I had a chance to send them to town. I went over and talked with Mrs Jones on the porch the rest of the afternoon. 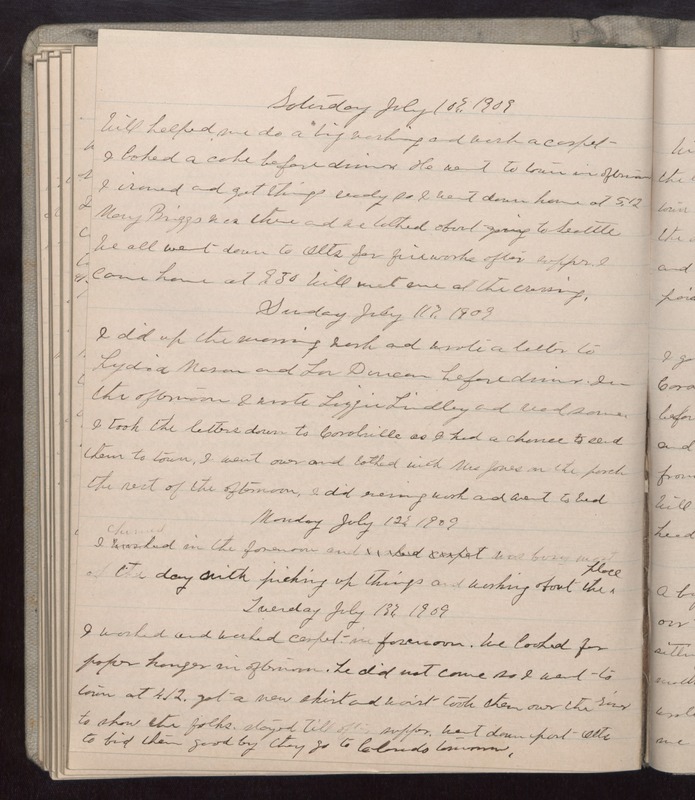 I did evening work and went to bed Monday July 12th 1909 I churned in the forenoon and was busy most of the day with picking up things and working about the place Tuesday July 13th 1909 I worked and washed carpet in forenoon. We looked for paper hangers in afternoon. he did not come so I went to town at 412. got a new skirt and waist took them over the [illegible] to show the folks. stayed till after supper. went down past Otts to bid them good by they go to Lelands tomorrow.